LYB | What Does LYB Mean? 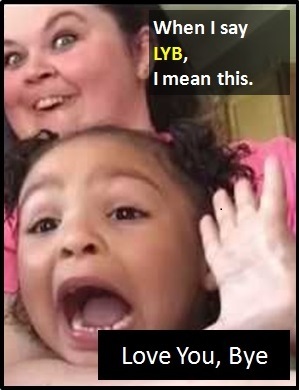 LYB means "Love You, 'Bye". LYB is an abbreviation of the sentence "I love you, goodbye". It is typically used as a quick and casual way to sign off a message to a friend or loved one. Of note, "Love You, 'Bye" is the title of an autobiography by UK BBC Radio 1 DJ Scott Mills (published in 2012), which recounts his background, upbringing and rise to fame on the airwaves. LYB is usually a friendly and informal "goodbye". Shazza: I'll pick you up after work. Trish: So will you be round to mine later? Ralph: Yeah, yeah, see you at 8pm. LYB. LYB is an abbreviation of the phrase "I love you, goodbye". It is typically used as a standalone declarative sentence (i.e., a statement) and does not usually form part of a wider sentence. Before the digital era, we might have just said "Love You, 'Bye" or something like "Lots Of Love, 'Bye" instead of using LYB.